SEBASTIAN – While Sebastian won’t see Hurricane Harvey, the storm is located over the southwestern Gulf of Mexico and moving towards Texas. Hurricane Harvey is about 335 miles southeast of Corpus Christi, and 325 miles southeast of Port O’Connor, Texas. A Storm Surge Warning has been extended northeast of San Luis Pass to High Island Texas. According to the National Hurricane Center in Miami, a hurricane warning is in effect for south of Port Mansfield to High Island, Texas. Harvey is moving toward the northwest at about 10 mph. A turn toward the northwest is expected later tonight. The storm will approach the middle Texas coast on Friday and will make landfall by late Friday night. The storm is expected to produce 12 to 20 inches of rain in areas of landfall through Wednesday. Several residents in Sebastian have family along the coast of Texas, and they’re quite worried. Hurricane Harvey currently has maximum sustained winds near 85 mph with higher gusts. 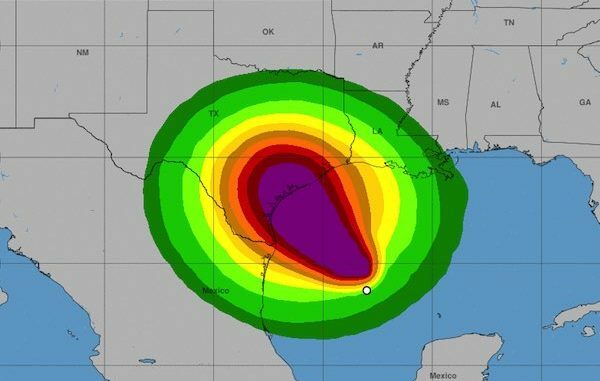 Harvey is expected to become a major hurricane by Friday as it reaches the Texas coast.